Tibhar Grass D.TecS is a long pips rubber that is very well known and popular across the world. Famous for its strong ability to reverse spin when blocking close to the table in OX, this highly disruptive rubber is changes the pace of a rally. While not easy to use, a skilled practitioner of an OX long pips push blocking style can make good use of Grass D.Tecs. On the other hand, if your choice is one of the sponged options, it is a solid choice for long distance chopping and fast attacks to put away loose balls. This is in part due to the combination of the tensor sponge on the bottom and the already fast pips topsheet on top. I recommend OX version for most effect, good rubber for players want to play long pips on BH. Nothing like it. My favorite got 15 Grass D.Tecs OX on all my paddles except one(Talon Ox). The best OX long pips for chop blocker. Order from Tabletennis11: fast shipping, very good price. I occasionally play long bead starting thirty years ago. While I like this as a defensive rubber, I don't see much difference from other much cheaper rubbers. They are equally difficult to pull the ball while hitting is OK. I have used GD for years on my backhand. In OX, the rubber can create wobbles and be very deceptive against many players under a 2000 rating. The downside is that it is very hard to create offense with it. Hitting with a top spin motion is nearly impossible. Using .5 or .9 sponge and higher makes attacking with the backhand topspin motion easier. 1.2 or 1.6 work even better for attacking. with sponge the deception is not there but the ability to slow down or speed up the action remains. The big change is having the ability to topspin with the backhand, and attack an opponent. I'm confident that most, if not all, players a bit over a 2000 rating use sponge. Excellent control with Ox, but very difficult to attack with it. An effective weapon against most players under 2000. Since more players are learning to play against long pips, using it with sponge to attack could be indicated. I had been a typical inverted rubber player on both sides of my blade for all of the time I had been playing table tennis. Did not play for many years and then got back into the “swing” of things about six years ago still using inverted rubber. Enjoyed the inverted rubber, but just to “mess around,”(about three years ago) I tried long pips rubber on my backhand and proceeded to bamboozle many players in our club even though I did not know how to use the long pips. The ratings of the players I compete against were/are as high as to be in the upper 1900s (FYI, my rating recently has been over 1800, and I think I can get to 2000). As I became more proficient with LP rubber I began to try different brands. On the advice of others who used the rubber in different clubs and my own personal experiences with various LP rubber, I started using GDT. At first I used sponge, and then I tried ox. By far, my control and deception were better with ox. No matter, the rubber is very difficult to control, especially when trying to loop(topspin) topspin. It is best to block, chop or use sideways strokes against topspin. Under-spin can be handled with an almost normal topspin stroke. There are some strong advantages in using this rubber. 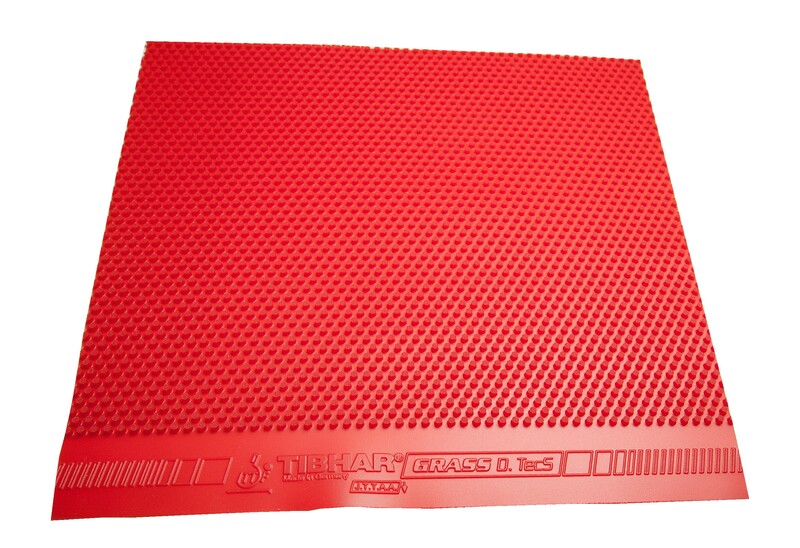 First, the rubber is likely the most deceptive legal LP rubber presently on the market. Second, this is a tensor rubber so it can be fairly fast. Third, the rubber is very good at slowing the pace of a game or speeding it up. My guess is that if a person becomes proficient at using the rubber and has good basic fundamentals the player might reach a level of somewhere over a 2200 ranking. It should be noted that elite players generally seem to have little trouble playing against long pips. On my forehand I use black Xiom Omega VII Euro 2.0 rubber. The sponge is medium at 42.5 degrees. My blade is a BBC (Blades by Charlie: bbc table tennis blades by charlie) and the model is called the Quantum Quad Trip. It is the best blade I have ever used and it is made specifically for long pips rubber. For now, I'm enjoying this rubber. This pimple is the best..
Take time to master but worth it. Produce disturbing shot in defensive game. Our club member ordered this rubber and he liked it very much. Good control, very deceptive and even he is able to topspin. Also it is last long. definitely he will buy it again. Thanks to TT11 for great service. Thanks to all good review. Indeed quite pricey, but worth a try. Used it in barricade blade and control is fantastic. Накладка для профи. Создаёт очень большое неудобство сопернику, но ошибок не прощает, нужно всё время быть собранным для выполнения элементов. I can say one of the best long pips. I can do anything I want. The best. l used ox,better for close to the table to med distance Blades I've used before are Viscaria, Primorac, Timo Boll ZLC. Now, I'm using osp immune,ox push blocker and ox classic. I tried Dawei 388D OX, but didn't like them much. I have been playing with Feint Long 2 with 1.1 sponge for a few of months now but after trying these pips in OX it just suits me much better. The spin reversal is nice with these, even the slightest topspin gets reversed. I found it quite easy to chop with mid distance as it's not too spin sensitive but you just have to get used to the throw angle and speed. These pips are very good close to the table too but not easy to use, you need a very soft and quick touch to get its full potential. Очень стоящая накладка для игры в защите - замечательно путает при определённом умении , а вот атаковать ей непросто. Of course these are great, everyone knows that. The price at TT11 is the best anywhere. Good reversal of spins that confuse your opponents, but bear in mind that it is also a bit difficult to control. You have to practice with the rubber constantly in order to get a better of the rubber. This rubber is good for blocking as well as attack. The rubber is as expected so far. Appears durable. Simply the best LP money can buy. Классика, наравне с curl P1r. Очень неприятны запилы и флэты при хорошей работе ног, естественно. Идеально для отработки 3й зоны на губке 1,2мм. Можно играть чопблоками перекрывая стол на OX (топшит без губки), но при таком раскладе игрок должен быть очень подвижным и уметь перекрывать форхэндом весь стол. Поэтому мысль о том, что Такой вариант подходит для "энергобережливых" - выглядит забавно. Замечательный шип. Немного сложноват -но это вторая сторона вариативности игры им. The beauty of this rubber is different response of play and returns for the opponent are tough as it creates lot of disruption (ox or the thin rubber). The rubber needs good practice to make effective use. This rubber is hard to control. Another easy rubber to play having very similar rubber to this is Dr. Neubauer Killer and Leopard and is creating beautiful backspin on opponents topspin and making tough for them to hit on the return. Good practice with this rubber can give you lot of advantage on people who don't know how to play against pips out rubber. Again the super fast and perfect service of tabletennis11.com is outstanding and amazing on packaging and shipment. I use this rubber on almost all my 13 c-pen rackets,except 1 or 2 w/ Dragon Talon all of them OX.I definetly prefer D.Tecs because on returns the ball dives and spins more .I have to mention this German made rubber got excellent quality and is very durable.A little pricey ...the only con. One of the best long pimples out there. I tried this with 1.2 sponge. For me, it offers 2 advantages over the OX version.Balls are easier to attack (including topspin) and the balls are returned faster (it give you opponent less time to react). The downside is that it is not as deceptive as the OX version. Passive blocks are easily returned. Using this LP (in the OX version) when paired with the right blade is a dream come true. ( I used the re-impact Tachi) It offers excellent deception and with passive blocks, it gives odd spinning and float balls which drives opponents CRAZY!. For aggressive players, active/attacking strokes can easily be employed when the ball is long or is bouncing above the net.Backspin can easily be lifted and sidespin ball pose not much of a problem. Shot balls and balls that bounce below the height of the net, however, can be handled by chop blocking , sideswipes or passive blocks. Returning topspin is somewhat tricky. If topspin is weak, it can be attacked but stroke must be perfect or else, you will probably hit the net and in some cases go off the table. Best option would be to chop, chop block , sideswipe or just plainly do a passive block. Strong, fast topspin is always very difficult to return with LP OX.I find it super difficult to attack. Best would be to chop, chop-block or passive block. Overall and excellent LP. BUT, one must have the right Blade or this LP can be very difficult to control. It is more speed than I used one. Need more practice. Returns any serve easily (with proper push technique) and sends back spin or a knuckle ball that most can't handle. The best and the number 1 of long pips . Perfect rubber i love it so much . the best in 0X. As far as I know this is JooSeHyuk's choice of LPs. Very funky knuckle balls when hit properly. Most of the best defenders at my local club uses this(with variable thickness). Only tried OX and thin ones so far but willing to try out thicker versions for long distance defense on my Butterfly JSH blade. otlicnije shipi tolko nado pravilno podobrat osnovanie. I've been using long pips for many years now, and I don't think I have ever seen a long pips with friction that is more difficult for my opponents to play with. Plays similar to Giant Dragon Talon, but a little faster and definitely more tricky for opponents. If you like a long pip that is grippy, where you can manipulate the amount and type of spin you are putting on the ball, this is for you. It's definitely not for a first time long pips player. For that, I'd recommend something with much more control. And I would personally only pair it with a blade that is All- or slower. I used to play an Off- blade with it and it was far too fast. You will get the most pips effect with no sponge. With the Donic Defplay Senso I am able to block, chop-block, punch block, chop, and hit very effectively. The amount of grip on the pips makes lifting against backspin very effective. Getting the right touch against fast dead balls is most difficult, but that's true for most long pips. Overall, this is a really great rubber! I used the pr1, I enjoyed this control near the table. on the market for that. 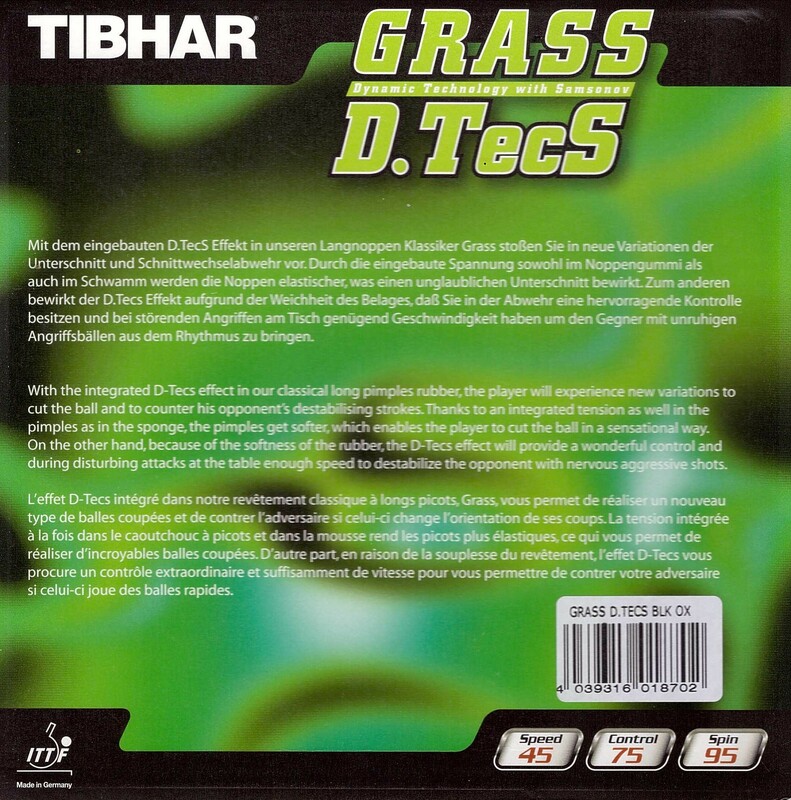 Along with Dornenglanz, Grass Dtecs is a fantastic junk rubber for wobble effects. Good rubber, nice shop! Satisfied! Took too long time to delivery. Playing with the OX long-pips is easier than with a sponge long-pips. production quality is excellent,pips will not brake for long time. and fast block.Good for spin manipulation ,gives some random effect. Very easy to control. Probably a good rubber but not for me at this time. Too lively and bouncy. I may need a bit more time to adjust coming from TSP Curl P1R. Just wanted to try this rubber out, but will probably go back to my old rubber. OX version has better control and this rubbers works better further away from table but still O.K. Excellent for defensive strokes on bh. Good control close to table especially with swiping strokes. Uses OX. Not a very quick rubber. Long durability. Causes a lot of confusion for opponent due to high spin reversal. I had the OX version of this rubber and never really figure out how to play with it.and found it very effective. The sponger version are way better for chopping and stable away from table for block. I Highly recommend this product and Table tennis 11 price is great. Given its disadvantages, I hate buying it, but I just can't win as many points with the others. I've tried many. It is a difficult rubber to play with. This product is for professionals only !! 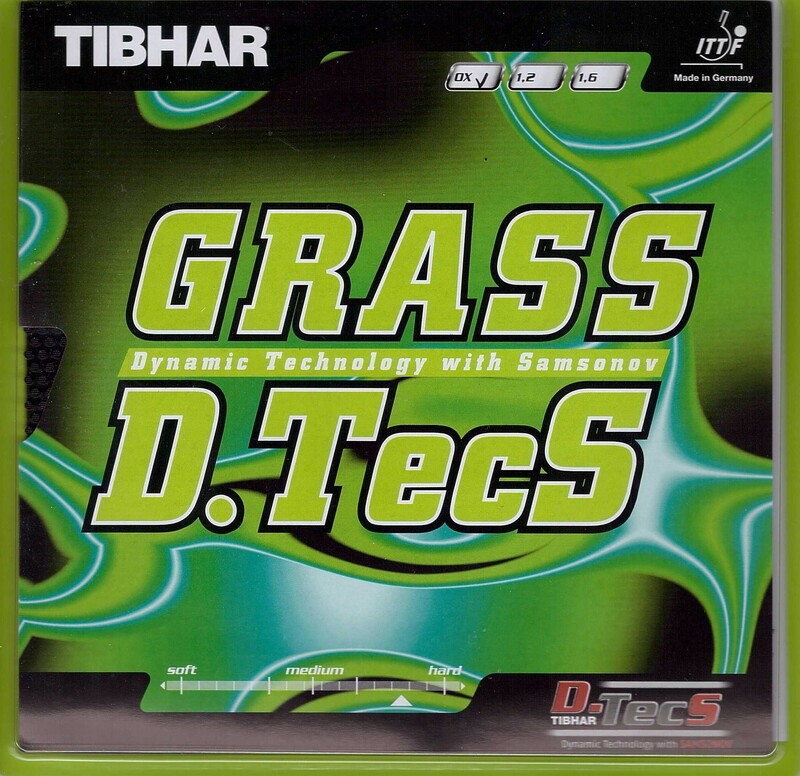 Tried GRASS D. Tecs for the first time. Definteily better than 729 755 OX rubber in terms of control but less wobbling effect and getting a lots of extra points on Chops. This is definitely the one to keep, will need to play more to learn how to use its full potential. Great PIP so far. Will try the sponger version next.